The Khmer Rouge were the followers of the Communist Party of Kampuchea led by Pol Pot. They seized power in 1975 and carried out a radical program aimed at turning Cambodians into “Old People” through turning to forced agricultural labor. 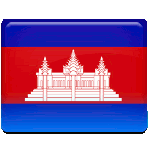 The National Day of Hatred was first observed in the People's Republic of Kampuchea in 1984. It was initiated by a group of intellectuals and clergymen. The English term “Day of Hatred” is somewhat incorrect. The Khmer name T'veer Chong Kamhaeng can be translated as “Day of Tying Anger” or as “Day of Maintaining Rage”. The date of May 20 commemorated two events: the beginning of mass killings in 1976 and the initiation of forced collectivization in 1973. The observance was typically marked by public speeches and burning of effigies of Pol Pot. During the UN peacekeeping operation in Cambodia in the early 1990s, the commemoration was put on hold. The celebrations were revived in the late 1990s. In 2001, it was officially decided to rename the event “Day of Remembrance”. Commemorations are still held, although they are of smaller scale now.